Nintendo says it will work to bring games previously deemed "too Japanese," such as Tomodachi Collection, to the West. Pikachu, the official mascot of the Pokemon franchise, is recognized globally as the cute, yellow, electric rat. But, he was almost transformed into a brawny mass of muscle for his intial release, Nintendo president Satoru Iwata reveals. "This cute yellow thing is not a monster, everyone told us," said Iwata. 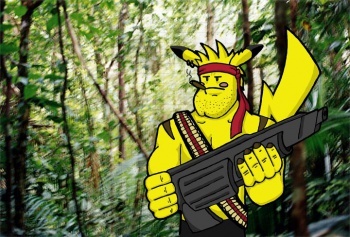 He said that mock-ups of a beefy, muscular Pikachu were created, and the Nintendo boss at the time, Hiroshi Yamaguchi, was advised that only a complete redrawing would make the Pokemon game sell well. But, Yamaguchi dug his heels in, and refused to alter everyone's favorite rodent, alongside the rest of the Pokemon cast. "When you adapt too much, you lose what's unique about you," Iwata reflected. Iwata's words ring true with what the very essence of Nintendo is about. To Nintendo, quality of content matters far more than appeasing current trends, and the company was able to devote years to the development of games and create hit after hit after hit. However, in facing three straight years of losses and a very lukewarm reception to the Wii U, Nintendo's strategy of staying firm until the world adapts to it is failing. Iwata agrees, it's time to change. "We need to work even more closely with the U.S. team, to make sure preferences in the U.S. are reflected at the development stage," Iwata said. He confirmed that Tomodachi Collection - or "Friend Collection" - a 3DS life simulation game in which Miis from consoles can interact with one another and develop via various activities, is currently being localized for a Western release, and that the company will consider localizing games that were, in the past, deemed "too Japanese" to succeed abroad.